A buyer’s market means it’s a good time to buy a home. Usually this occurs at a time when there are more homes for sale than there are buyers resulting in lower asking prices and plenty of choices. In addition there is less competition to contend with and possibly fewer competing bids on a home that you may be interested in. But how do you know if it’s a buyer’s market? One way to know is to check how long homes in the area have been for sale. If you see a lot of homes that have been on the market for 6 months or longer this is an indication that it is a buyer’s market. You can also ask your agent if there is more inventory than usual, this is another sign. Finally, if comparable properties were previously selling for more than the asking price of most of the homes currently for sale, than it is a great time to buy! 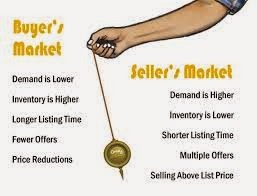 A seller’s market is, of course, the opposite situation when the amount of homes for sale is much less than the demand. This results in higher selling prices and less choice for the buyer. Obviously a homeowner can ask a higher price when there are more buyers than sellers because home seekers are competing to buy a home in that particular area. In addition, some buyers may place a bid that is higher than the actual asking price in an attempt to have their offer accepted. In a seller’s market it’s all about who wants the home the most. One thing to keep in mind is that a seller’s market doesn’t necessarily mean that the homes in a given area have increased in value. Rather, it means that buyers are willing to pay more. So what determines whether it is a buyer’s or a seller’s market? The truth is that there are many, many factors that affect the housing market and it never stays the same very long. Like any other commodity, in the end it all comes down to supply and demand. The higher the demand, the higher the price. This is one of the many reasons that having a competent and knowledgeable agent is important for both buyers and sellers. There’s just too much to know and an agent that that is familiar with a specific area can guide you in the right direction. This is one situation where what you don’t know can cost you plenty.